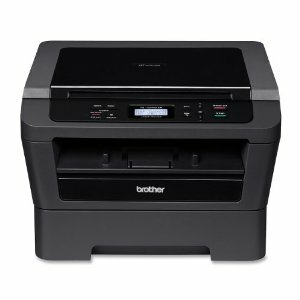 The Brother HL-2280DW compact, monochrome laser printer includes built-in wireless and Ethernet network interfaces for small office or home office printer sharing. Offering a fast print speed and automatic duplex capability, you can print professional-looking two-sided documents and booklets with ease. In addition, it features a flatbed document glass for convenient copying and color scanning. Plus, an optional high-yield replacement toner cartridgeis available to help reduce your operating costs. Enjoy the convenience of producing high-quality documents right from your desktop or small office. With a print speed of up to 27ppm, you can stop wasting time and move on to other pressing tasks. Print high-quality output at up to 2400 x 600 dpi for professional reports, spreadsheets, correspondence or other important business documents. Use the automatic duplex printing feature to create professional two-sided documents, brochures and booklets. This feature helps you save paper and reduce costs by cutting paper usage in half. Use the document glass for convenience copying or high-quality color scanning. Its advanced capabilities allow you to scan documents to a file, image, OCR, or e-mail. The HL-2280DW also offers stand-alone copying, and the ability to reduce/enlarge documents from 25-400 percent. Share with others on your network via built-in wireless 802.11b/g or Ethernet interfaces. Eliminate extra cables and conveniently place your printer with wireless networking or connect locally to a single user via its Hi-Speed USB 2.0 interface. Users with wireless access points that support Wi-Fi Protected Setup or AOSS can automatically configure their wireless settings by simply pressing a button on their router. Print from your mobile device via Cortado Workplace*, a FREE printing app that enables you to store and wirelessly print documents from your Apple, Android, or Blackberry mobile device. The HL-2280DW can meet all of your printing needs via an adjustable, 250-sheet capacity paper tray1that handles letter or legal size paper and a manual feed slot for printing envelopes and letterhead. In addition, a straight through paper path via the manual feed slot ensures your letterhead and envelopes always look their best. In addition to being affordable to purchase, the HL-2280DW uses both standard and high-yield replacement toner cartridges. Using the high-yield 2,600-page2toner cartridge (TN-450) can help lower your operating costs. In addition, help save money by using Toner Save Mode for your less critical business documents.